In the early years of the Republic there were many potential threats to the new German Government. At the same time as the republic was being declared, revolutionaries were attempting to seize power in Berlin. The unrest in Berlin led to the interim government moving its headquarters to the quieter town of Weimar. Further unrest followed as different groups sought to take advantage of the uncertainty that the post war situation had caused. The question today is not democracy or dictatorship. The question that history has put on the agenda reads: bourgeois democracy or socialist democracy. For the dictatorship of the proletariat does not mean bombs, putsches (pushes), riots and anarchy, as the against of capitalist profits deliberately and falsely claim. Rather, it means using all instruments of political power to achieve socialism, to expropriate the capitalist class, through and in accordance with the will of the revolutionary majority of the proletariat. On January 1st, 1919, members of the Spartacist movement rose in an attempted revolution. Initially this move was opposed by both Liebnecht and Luxemburg, the leaders of the movement. 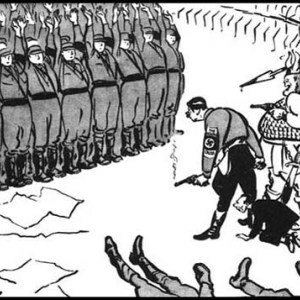 The newly formed Weimar Government reacted promptly, and brutally. The army was deployed to bring the revolution to an end, and these were aided by the Frei Corps, a paramilitary group consisting of former servicemen. Order had been restored to the streets of Berlin by the 13th of January. Both Rosa Luxemburg and Karl Liebnecht were killed whilst in police custody. “Great masses of workers…answered the call to struggle. Their favourite slogan ‘Down, down, down’ (with the government) resounded once more. I had to cross the procession at the Brandenburg Gate, in the Tiergarten, and again in front of general staff headquarters. Many marchers were armed. Several trucks with machine guns stood at the Siegessaule. Repeatedly, I politely asked to be allowed to pass, as I had an urgent errand. Obligingly, they allowed me to cross through. If the crowds had had determined, conscious leaders, instead of windbags, by noon that day Berlin would have been in their hands.” Noske, in a written recollection of the Uprising. In March of 1920 a right wing group, led by Wolfgang Kapp rose in Berlin. This group consisted of members of the paramilitary Freikorps and had the support of many army officers. Kapp was a right wing journalist who opposed the government on the grounds that he held it responsible for the humiliating Treaty of Versailles. This view was shared by many leading officers of the German Army, who Kapp turned to for support. Two significant officers chose to support Kapp, General Luddwitz and General Ludendorff. On 13th March, Luddwitz orchestrated an uprising in Berlin. Troops sympathetic to the uprising took control of Berlin and a Right Wing Government was proclaimed by Luddwitz. Analysis of several factors is possible here. The army didn’t openly support Kapp, nor did it rush to the aid of Ebert and the government. What does this mean? How could the Government ensure its survival? Why did the people of Berlin support the Government and go on Strike? “The pervasive social and political discontent growing out of Germans’ grievances, justified or not, soon had consequences. A right-wing coup d’état in March 1920, the Kapp Putsch–named for its leader, Wolfgang Kapp–failed only because of a general strike.The military had refused to intervene, although it did brutally suppress some Communist-inspired uprisings shortly thereafter. The establishment’s tacit support of unlawful right-wing actions such as the Kapp Putsch and violent repression of the left endured to the end of the Weimar Republic. This support could also be seen in the sentences meted out by the courts to perpetrators of political violence. Right-wing terrorists usually received mild or negligible sentences, while those on the left were dealt with severely, even though left-wing violence was but a fraction of that committed by the right. ” Photius Coutsoukis, 2001. Inflation is the term used to describe an increase in the cost of goods in an economy. Typically a rate of inflation will be between 2 and 6% over the course of a year. This means that if something costs £1 at the start of the year, it will cost £1.02 – £1.06 a year later. In general, it is accepted that relatively low levels of inflation are a good thing for an economy, however high levels of inflation pose problems as companies cannot accurately forecast their results and the value of money drops disproportionately to the value of goods and / or labour. Hyper inflation is a term used to describe levels of inflation that are very high. This was the case in Germany in the period 1919 – 1923. In January 1919 one US Dollar could buy 8.9 German marks. In January 1922 one US Dollar could purchase 191.8 German marks. What does this mean? 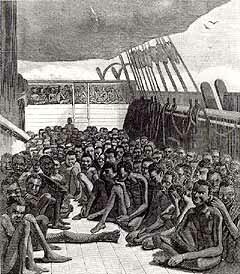 The Reparations Bill. Having to pay the Allies large sums of money had a significant impact upon the German economy. It meant that a large proportion of income had to leave the country. French occupation of the Ruhr. The Ruhr valley is the Industrial heart of Germany. Whilst it was occupied by the French, the german economy could not benefit from its industrial output, thus straining the economy even further. The cost of War. even without the reparations, the war had a high cost for Germany. Loss of land and colonies. This led to the cost of raw materials increasing as the German economy could no longer depend upon cheap imports from her own colonies or produce the raw materials in the same quantities from German sources. The increase in the cost of raw materials was inflationary, it meant that prices would have to rise. Printing more money. In order to control inflation, a Government can limit the amount of currency in circulation. At the height of the reparations repayment crisis the Weimar Government did the exact opposite, it printed MORE money. The scale of hyperinflation can be seen in this chart which illustrates the cost of items against an index. 1 is the starting point, anything above 1 is an increase in cost relative to that first figure (so 3 would mean that items had risen in price by 300%). NB: Usually an index would start with 100, the figures here are so large that the number of 0’s would simply become too onerous to type out! 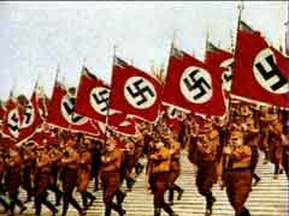 Schoolshistory.org.uk > European and World History > Weimar and Nazi Germany > 1919-1923: Years of Crisis?